The North American International Auto Show gets under way in Detroit this week, and despite reveals of countless drool-worthy supercars, energy-efficient electric vehicles, and autonomous cars that drive all by themselves, Playmobil might actually steal the spotlight with a perfect miniature version of the Porsche 911 Targa 4S. Playmobil’s Porsche 911 Targa 4S parked in front of the real thing. As the toy maker continues to expand its licensed offerings (remember, Ghostbusters Playmobil should be arriving sometime this year) the new 911 Targa 4S follows in the footsteps of the Porsche 911 Carrera S that Playmobil released in 2016. As with last year’s replica, the new Porsche 911 Targa 4S is first and foremost a kid’s toy, so it can take a beating during playtime, but that doesn’t mean that Playmobil has skimped on the details. The Playmobil toys you had as a kid never looked this good. The tiny replica, which measures in at around a foot in length so that it’s large enough to accommodate a pair of Playmobil figures inside, matches the curves and contours of its real-life equivalent, even down to the optional five-point hubcaps. With three AAA batteries inside, the Targa 4S’ headlights, taillights, and dashboard all light up. Like last year’s Playmobil Porsche model, the 911 Targa 4S features LED-illuminated headlights, taillights, and a dashboard, powered by three AAA batteries which are installed on the underside of the vehicle, and activated through a simple button. How could you not love that smile? In terms of raw horsepower, the toy version of the 911 Targa 4S measures in at somewhere around zero without an engine or powertrain under the hood. But with enough imagination, or a steep enough ramp, you can easily best the real car’s 4.2-second zero to sixty acceleration time. Only a small section of the Porsche 911 Targa 4S’ roof can be removed. 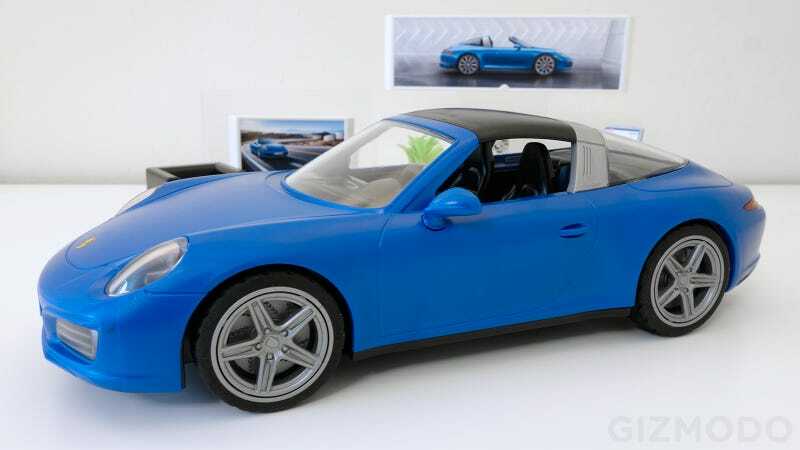 In terms of customization, Playmobil’s 911 Targa 4S doesn’t come with as many spare parts as were included with last year’s Porsche 911 Carrera S that let you upgrade the spoiler, swap out the front end, change up the hubcaps, and even completely remove the roof. But like with the real Targa 4S, you can remove a section of the roof on the the Playmobil model to turn it into a pseudo-convertible. Yes, you will look as cool as this guy does with this 911 Targa 4S replica on your desk. Removing the roof panel is also the only way to insert Playmobil figures as the passenger and driver, since the vehicle’s doors on the toy version are permanently fused shut. It is, after all, just a toy. If that Playmobil figure has to ask the price, he probably can’t afford one. If you like a lot of accessories for displaying your replicas, however, Playmobil certainly hasn’t skimped on what you’ll find in the box with the 911 Targa 4S. The car comes with an entire showroom, including furniture, signage, a miniature TV showing a promotional video, a car salesman, a mechanic, and an informational display stand listing the 911's specs. Last year’s Playmobil Porsche 911 Carrera S on the top, next to this year’s Porsche 911 Targa 4S on the bottom. For this year’s Porsche model Playmobil could have simply swapped in a different color plastic into the injection molding machines at its factories, and called it a day. But while the two models do look very similar, aside from a red versus blue finish, when you study the pair side-by-side it becomes apparent that Playmobil’s new 911 Targa 4S is a completely new vehicle, and just as worthy of a spot on your shelf as the 911 Carrera S, if you’re a Porsche fan and collector. As with last year’s Porsche 911 Carrera S, Playmobil’s new Porsche 911 Targa 4S model is available now for $45 which is a downright steal when you consider the $122,600 sticker shock of the real thing. You’ll never get to experience the feeling of the wind in your hair as you race down the coast in Playmobil’s version, but you also don’t need to pay for insurance or maintenance. If you’ve always wanted a Porsche, this is easily the most fiscally responsible way to put one in your (toy) garage. Playmobil or Lego, what's your favorite childhood toy?